Retired Army Brigadier General Lloyd Rector examines the law school class ring he lost in a Canadian airport 52 years ago. A woman in Newfoundland recently found the ring and got it back to Rector. After 52 years, retired Army Brigadier Gen. Lloyd Rector has his law school class ring back, and a Canadian woman he's never met to thank. Rector was a soldier returning from a tour in Germany back in 1957 when the plane he and his wife were aboard had a layover in Newfoundland. 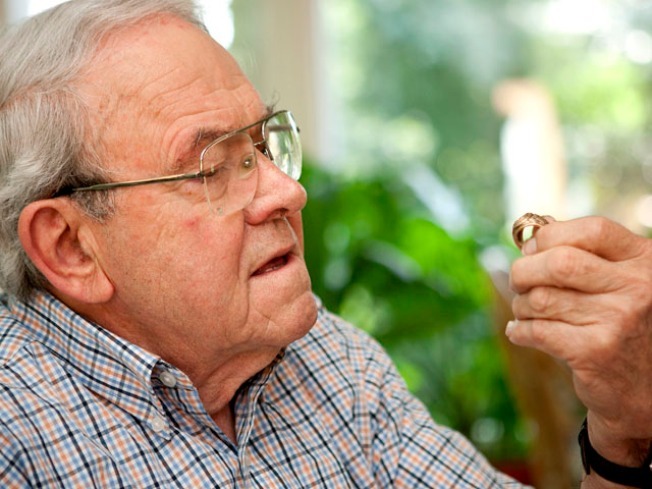 When they got back on their plane to head home, Rector knew right away his Wake Forest College Bachelor of Laws Class of 1953 ring was missing. He even knew where he'd left it. “I looked over at my wife and said, ‘Caroleen, I left my ring in the washroom,’” Rector, now 80 and retired, recalled in an interview with the Wake Forest University School of Law newsletter. But by then, the plane had lifted off and Rector knew it was too late. A flight attendant assured him that if it was found, he'd get it in the mail. Which he did -- half a century later. Rector went on to became a brigadier general and the assistant Judge Advocate General for Military Law at the Pentagon before retiring in 1984. The Drexel, N.C. native went on to work at his law school alma mater, even without his ring. But the memory of how he lost it nagged at him over the years. “I had told the story among the family, and we all kidded about it. I wondered, ‘Whatever happened to that ring?’” said Rector, whose wife passed away in April. In July, a letter arrived at the law school containing a detailed description of the ring. The letter was addressed to the school registrar and sent by Mary Bartlett of Gander, Newfoundland, along with her address and phone number. The letter put registrar LeAnn Steele on a paper chase, and gave her plenty of clues. The initials “LKR” were engraved on the inside and the university motto, class information and the symbol for the international legal fraternity -- Phi Delta Phi – were carved on the ring’s surface. And there was another piece of information: the black onyx stone set in the gold ring was missing. “Based on the description there was no doubt that the ring belonged to a Wake grad,” Steele said. She combed through an alumni directory, looking for a match of initials and zeroed in on Lloyd Kenyon Rector. Steele, who it turns out knew Rector from his days with the faculty, called him at his nearby home in Winston-Salem to deliver the news. Bartlett had come upon the ring in an old tackle box left to her husband by an uncle. The uncle, Ralph Christian, had been a security guard at the airport. He died about 20 years ago, and the tackle box ended up with the Bartletts. But it would be years before they even looked inside. “We’re starting to downsize, going through some old junk in the house, and I found the ring, along with the hooks and stuff that were in the box,” Bartlett told the school newsletter. Bartlett still wears her own class ring from nursing school, and figured someone, somewhere would like to have the one she'd found back. She was right. Rector is thrilled to be reunited with the long-lost law school memento. “The ring now means more than it did when I first got it, because of all this, and the history behind it,” said Rector, who plans to get a new stone for the ring and pass it on to his sons and grandchildren. “It still fits,” he said.